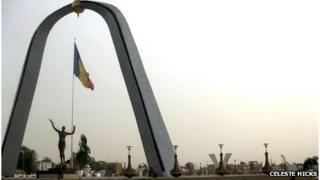 In 2008, rebels in the African country of Chad came close to toppling President Idriss Deby Itno. Four years on, President Deby is trying to show the rebellion has been defeated by transforming Chad into the "shop-window of Africa". Strange how once a place has changed it is almost impossible to imagine how it was before. So it was when I arrived back in Chad after a two-year absence. I knew, or at least I thought I knew, the Palais Rose, home to President Deby, was parallel to the airport. But everything seemed completely distorted now the old centre of N'Djamena - a large gendarmerie barracks, which back in the day was frequented by hundreds of young and often mean-looking soldiers - has been demolished and replaced with the impressive Place de la Nation. My Chadian friend Nelly's old car rattles and shakes as we sweep past the shiny new triumphal arch that stands at one end of the Place, opposite the presidential palace. "By the way, what happened to that good old car I sold you when I left?" I ask. She laughs and says it blew up. The Place de la Nation really is an amazing sight. It is home to a number of giant TV screens, a proud fluttering Chadian tricolour flag, and bronze statues depicting freed slaves and the country's most famous wildlife, including, weirdly, a squirrel. I look back over the boulevard and try to remember what used to be there. The scorching midday sun is causing heat waves to rise from the new tarmac - I can barely picture the muddy and dirty warren of streets that once stood here. It is not without irony that the legs of the triumphal arch on the Place stand almost exactly at the point which rebels reached in the city centre, when they came within hours of toppling President Deby back in 2008. When I first arrived in Chad not long after, the city was in virtual lock-down, with gangs of soldiers riding around with sprays of rocket-propelled grenades hanging off the back of their Land Cruisers. Road-blocks were everywhere and it was not uncommon to be stopped in the dead of night and forced to stand in the street while some drunken soldier rummaged through the glove compartment, searching for a problem with my papers. Chadian television repeatedly showed pictures of the bloodied and miserable faces of captured rebels, while their leaders issued defiant statements almost every week. Four years later and it is clear the president wants to show that the rebellion has been defeated and he is firmly back in control. President Deby has gone all out to complete his project of transforming N'Djamena from a dusty unknown backwater with an unpronounceable name, to what he is calling the "shop-window of Africa". Using the huge reserves of cash the country has earned in the past 10 years since the beginning of an oil-extraction project, the city has seen startling changes - and not just around the Place de la Nation. Nothing much has changed. What we really need is investments in education and health. Two-thirds of roads have been paved since 2008, a new maternity hospital has sprung up and most of the government departments boast new headquarters in a variety of pastel shades. No doubt shocked by the speed with which his seemingly indestructible on/off buddy Col Muammar Gaddafi was disposed of last year, President Deby's calculation must be that if he can give a physical demonstration of the benefits of his tenure over the oil project, he becomes more secure. His deal to produce petrol for domestic consumption at a new Chinese-owned refinery has dramatically reduced the price of petrol at the pump. But this does not wash with many ordinary Chadians. "It is just superficial," says my friend Nelly. "What we really need is investments in education and health. Nothing much has changed." We are sitting on one of the park benches that overlook the Place de la Nation, eating pistachio ice creams. We have had to park the car by the side of the road for a few minutes because the engine has overheated. Two entrepreneurial young men have arrived to hose down the engine with water they have pumped from the Chari River. She is right. The energetic new building spree does little to improve people's real lives in one of the world's poorest countries. Three times in the past eight years Chad has been hit by terrible food shortage, caused by poor and unpredictable rains. This year more than three million people are thought to be affected, and there has been a huge increase in the number of people turning up at centres treating hungry babies. A presidential election was boycotted last year by opposition leaders who called it a farce. President Deby won 83% of the vote. The literacy rate is just 34% and the country - which was once polio-free - is currently suffering one of the world's worst outbreaks of the disease. Some things really do take a long time to change. Read more or explore the archive at the programme website.